I have a confession to make: I’ve lived just over an hour from Gore Mountain for all but 5 years of my life, but I’ve never been there. I haven’t even taken a gondola ride. This winter, I’ve decided to stop making excuses and join my friends on the slopes. Before I do that, however, I thought it’d be a good idea to scope out the trails before the snow to see what I’m up against. 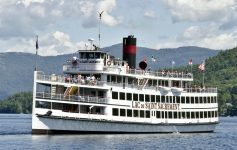 The LakeGeorge.com team has been closely following the progress of the improvements at Gore since the day the state funding was announced. With so many avid skiers and snowboarders on the team, we started pestering Gore to let us see the progress. When they agreed to give us a tour, I jumped at the chance. Bone’s office and the rest of the Gore offices are inside of the Northwoods Lodge at the base of the resort. As we made our way to the dining area of the lodge, Bone shared the first fun fact of the day. Fun Fact #1: When Gore Mountain opened for the 1967 ski season, Northwoods Lodge was the base for the original red gondolas. We took a look around while Bone explained what’s happening in the space. Since the lodge houses the Mountain Adventure kids program, the Snow Sports School, and the equipment rental & repair shop, it was getting a little crowded. What the team at Gore decided to do is add an addition to increase the space. 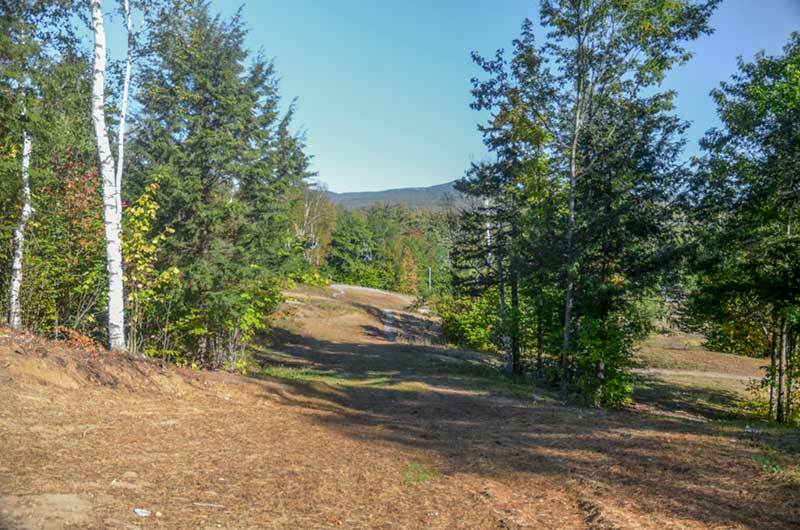 When it reopens, there will be more space for the Mountain Adventure program, food service for the Snow Sports School, expanded offerings in the equipment shop, and larger bathrooms. From Northwoods Lodge, we hopped in Bone’s truck and began ascending the mountain. For everyone who doesn’t regularly go off-roading or drive up unpaved mountains, let me just say how incredibly skilled Bone and his team are. I would not want to drive that path, let alone carrying a load of construction materials. Fortunately, some trucks carrying materials were able to access the mountain from Barton Mines, which is a slightly easier path. While Bone navigated the path, he noted points of interest along the way. We listened to his history with the mountain and got insights on this year’s projects. It turns out, many of these improvements were just dreams for years but had been thought out enough that within days of the funding announcement the design team was finalizing plans. After a short ride, we reached the summit of Gore Mountain. 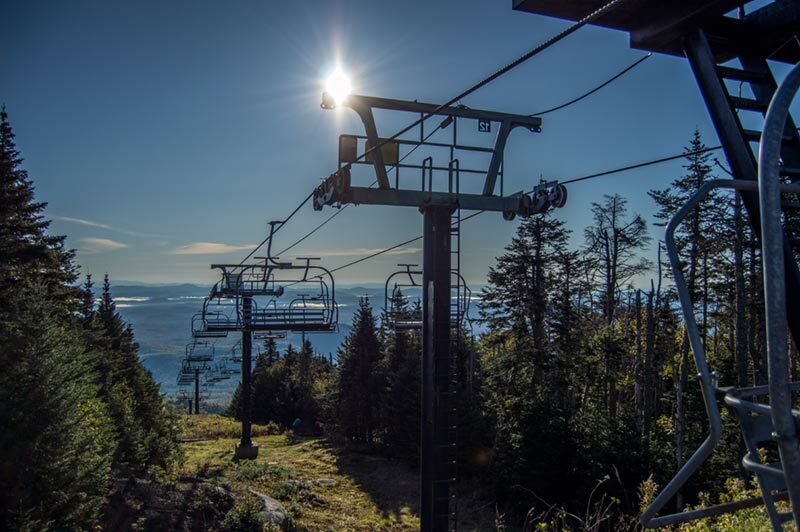 If you’ve never been to the summit of Gore Mountain, you’re seriously missing out. The views are breathtaking and the trails challenging according to Bone and Scott. If I focused on the views, I could push out the anxiety of being 3600′ feet up. Coming this season is a true pièce de résistance for the summit. Before I share the details, let’s get on to our next fun fact. 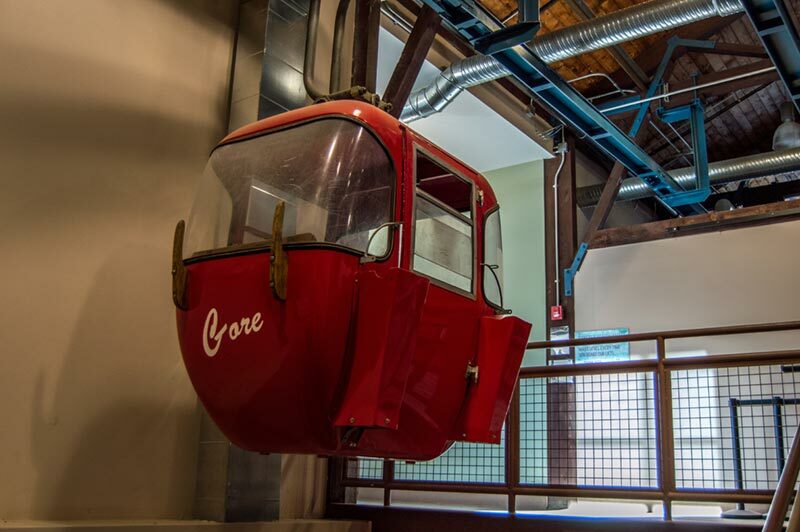 Fun Fact #2: The red gondolas went to the summit and offloaded inside of a building that has stood empty since the Northwoods Gondola was installed in 1999. 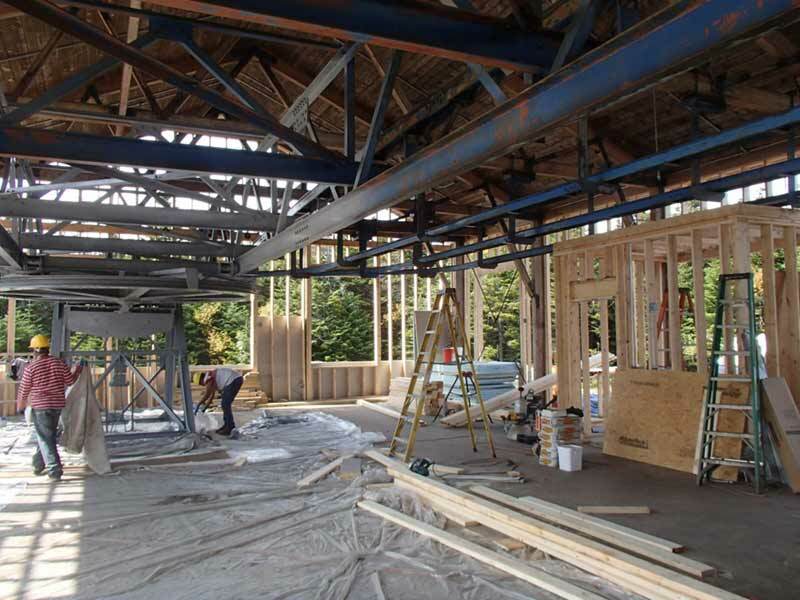 The original lift machinery in Straight Brook Lodge during construction. That empty building is being put to good use. 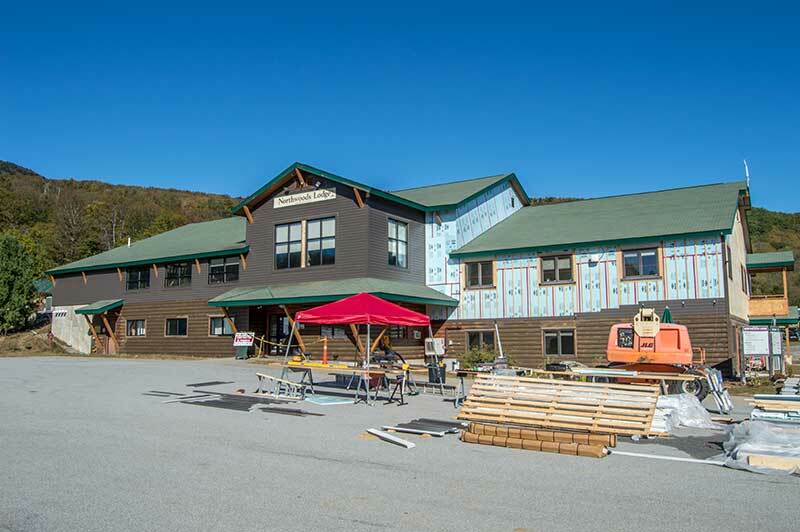 It’s being transformed into the Straight Brook Lodge: a place to warm up, grab a snack, and share stories of conquering the trails with fellow skiers and snowboarders. Much of the lift machinery was intact, so the Gore team designed around it, giving the lodge that wonderful rustic industrial look. It also features the original floor, which was taken out so they could install steel beams below before putting it back into place. 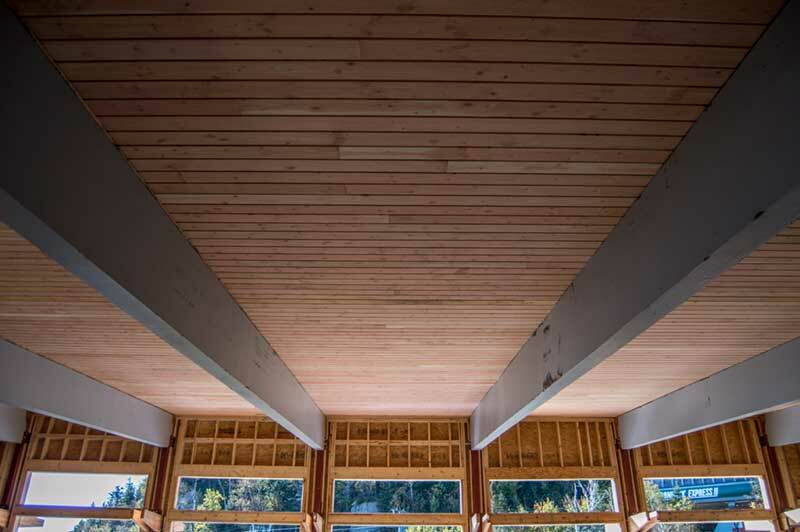 The lodge will also have a covered deck, perfect for taking in the crisp mountain air. While checking out Straight Brook Lodge, I learned that Gore is taking steps to make their operations more sustainable.In 2016, they purchased solar farms which will offset 85% of the mountain’s energy usage. Straight Brook Lodge is a prime example of those efforts. The restrooms will feature composting toilets, which will transform waste into an eco-friendly solid. The process uses cedar chips, peat moss, and other filtering methods to create an easy-to-clean-out end product come spring. What I found even more fascinating, is the siding on Straight Brook Lodge. 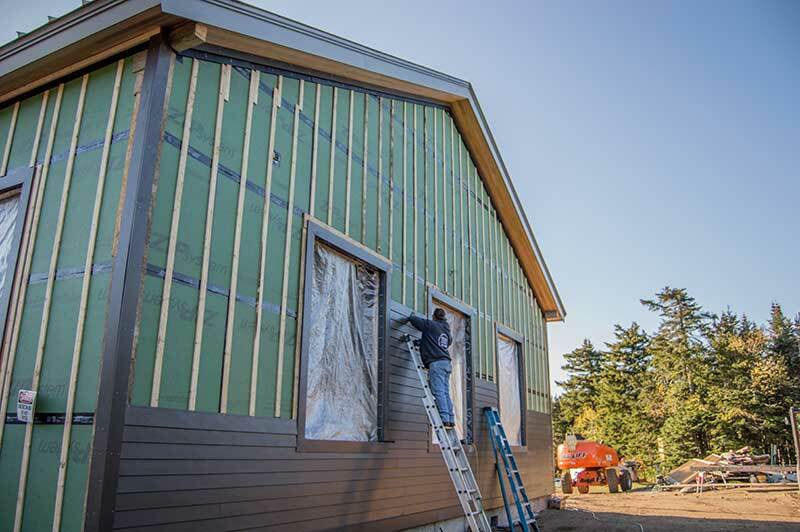 Rather than going with more traditional wood siding, they’re using a product called Hardie Board siding. It’s made from concrete and sustainable materials and will withstand the elements for much longer than other materials. Fun Fact #3: Hardie board siding can be made to look just like materials like wood. It can also come pre-painted from the factory. Don’t you wish your office had these views? That is, in fact, the Saddle Lodge and yes, that’s a second floor. 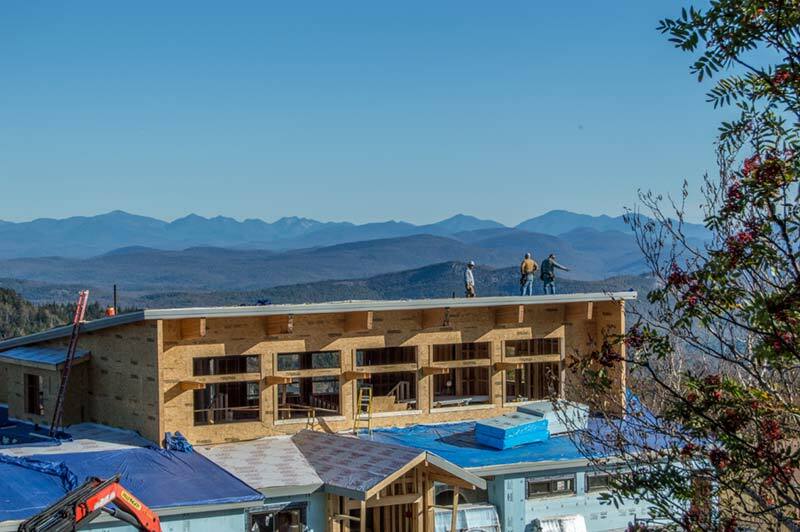 The addition doubles the size of the lodge, making room for up to 250 people to enjoy a meal, relax by the fireplace, or drink in those incredible mountain views. 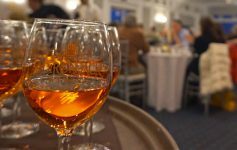 On weekends and holidays, you can head up to the second floor for table service dining. 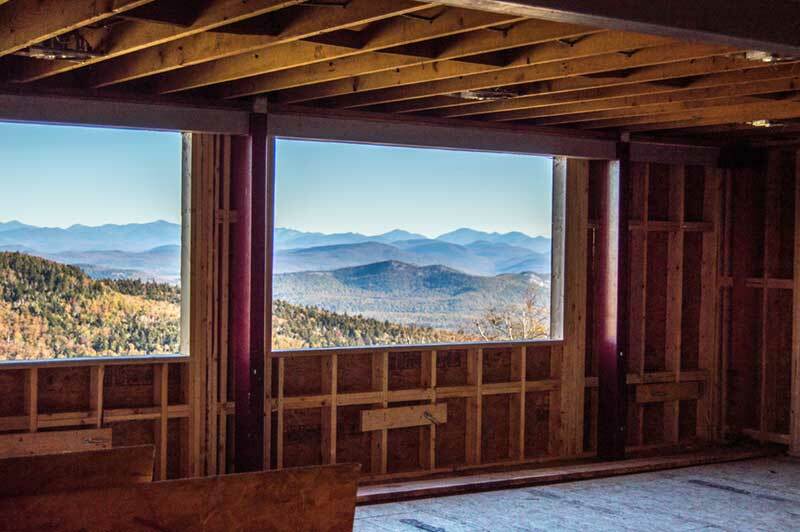 With a brand new kitchen in place, the Saddle Lodge will offer more menu options, allowing guests to switch up their usual slopeside meal. The Saddle Lodge was a complete rebuild, but some original elements were preserved. As you enter the lobby, you’ll see what was the arched entrance. The new entrance and lobby were built up around the concrete, preserving the chalet-style charm. Locally sourced hickory chairs and tables will add to the lodge’s warm atmosphere. Fun Fact #4: They flipped the pitch of the Saddle Lodge roof to accommodate the second floor. The original beams were jacked up, making the roof slope away from the chairlift. 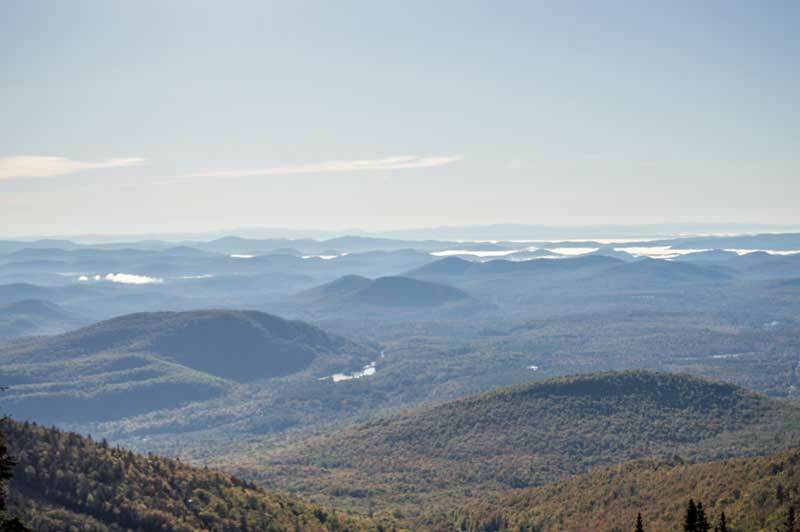 Fun Fact #5: Gore has named many of its newest trails after Great Camps of the Adirondacks, in honor of a building style that blends into the surroundings and preserves materials. Since neither Scott nor myself had been over to the North Creek Ski Bowl, Bone offered to show us around. He walked us through the ski bowl’s history and explained how the layout of the Nordic trails is important to attracting competitive races. The Nordic Trails were added to the ski bowl in 2016. This offseason, the Gore team widened two of the trails to maintain consistent grooming throughout the system. A bypass was also added to help keep Nordic and downhill skiers segregated. 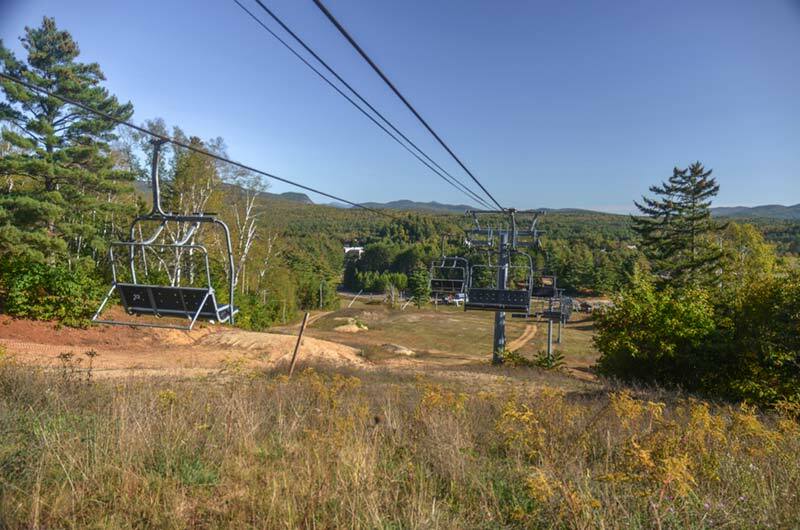 Gore Mountain is also working on attaining an International Ski Federation Certification, which would bring premier snow sports competitions to the North Creek Ski Bowl. The Nordic Trails have seen some competition and have been very popular with local high school Nordic teams who did not see much snow on their traditional trails. Gore is continuing to make upgrades to their snowmaking equipment to keep those trails covered in white. More than 200 new heads for ground guns are on their way to the mountain. Also coming are 80 tower gun heads that are more efficient than the current models. These upgraded heads will lower energy costs while improving Gore’s snowmaking efficiency. This year, you’ll see a new parking area as you make your way to the Gore gate. Parking Lot G has room for nearly 200 cars, which is more than the access road’s capacity. With those cars parked away from the access road, shuttle services will be faster and use less fuel. The team has a few tricks up their sleeve. 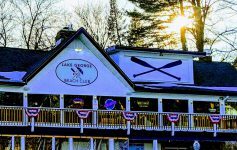 While they continue to beef up their offerings on the mountain, they are hoping to draw more visitors into North Creek and local businesses. They are also looking to add a unique year-round attraction. Gore is currently evaluating zip lines, alpine coasters, or a hybrid of the two known as a zip coaster to be installed in the future. 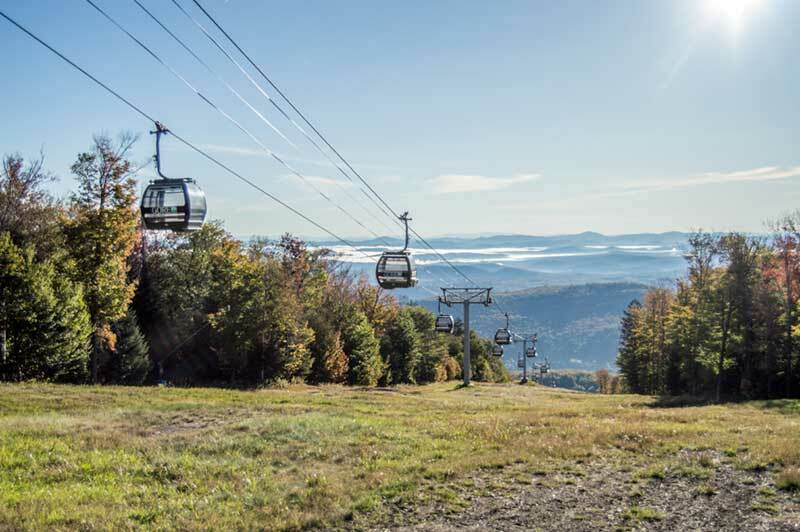 Additional improvements Bone and his team are considering include an expansion to the Village Chair at the North Creek Ski Bowl and upgrades to their pump house and reservoir which will increase their snowmaking capacity. I asked about season passes during our tour – I’m pretty optimistic that my return to the slopes will go well. If you haven’t gotten yours yet, don’t wait much longer. Prices go up on November 18th for all pass types.